At 3:51am my phone goes off signaling that I have been invited to edit a document on Google Drive. Luckily, I am a heavy sleeper and an annoying signal of an incoming email cannot wake me up. When I open my eyes and stretch lazily at 6am, there’s this invitation and two other emails with lesson plans and LAs waiting for me – TP4 today. I will be looking through them while I’m sipping my morning coffee still at home. By the time I arrive at the office, trainees will have printed out their materials and prepared for their lessons. We can blame it on Google, Evernote, Dropbox and other companies which develop collaborative environments, word processing and other software, we may rant and rave about the amount of work it adds, but the truth is that CELTA is going has gone techy. I’m going to talk about a few free websites and programmes which have helped me make my life trainees’ lives easier. I’ve been using google drive for storing files for quite a while. It has been serving as a whiteboard for online classes, too. It’s week one TP2, and one of my trainees comes up to me while I’m getting ready to go home, and asks me to look at his lesson plan before the next morning and comment on it using a shared document on Google Drive which he would create, I think “Why not?” and this is how it all starts. From now on trainees know that they can share their LPs, LAs, WAs documents with their questions (so that I don’t end up commenting on every little thing and they don’t blame me for not warning them that this particular concept checking question won’t work), and I’ll be looking at them from 6 a.m. till 7 a.m. This means that they don’t need to wait for me to arrive at the office to answer their questions. At 9:30 a.m. they will start teaching their lessons with no questions left unanswered. All this technology makes us available even when we are at home doing housework, so it was important to make it clear that I would see the email and I might respond straight away, but I want to have a life, which is why there are some fixed times (10 p.m. and 6 a.m.) when I respond to all CELTA-related emails. Unless it’s a quick question which can be answered straight away, of course. Also, not all of our candidates took advantage of this opportunity because of a lack of computer literacy. For some people CELTA is already stressful enough and they don’t want this extra pressure of having to set up a google account / learning to use google drive / learning to edit documents online. Our offices are open from 8am till 7pm with the course running from 9am till 5pm. The majority of our trainees always want to prepare at home, and in the past they used to have to copy heavy folders onto their flash drives, which would then get lost, stop working, etc. I know that on any online course there should be at least one getting to know you task in week one. I’ve always known it, but I failed to set it up before the beginning of the course (possibly because using moodle was a spontaneous decision and it was set up a week before the course started). It would have helped trainees get to know each other before the course and made them feel more comfortable using the website. The result was that some trainees never / rarely used the web resource because they felt they had enough to do and didn’t want any extra pressure of having to work with technology. Also, having organized the course into topics, I ended up having to explain to our trainees where they can find specific books, articles, samples and guidelines. What seemed very logical to me turned out to be confusing for those who had never seen those resources. So, the first thing I am going to do now is organize it in a weekly format so students can go home, access the website and read the articles from that day’s input sessions without having to search for them. We’ve been trying hard to make our trainees’ lives easier, time to think about the trainers. This year we implemented advanced course management (http://www.celtatrainers.com/acm_intro) developed and graciously shared by Nikue Gardner. Its main advantage is that it saves plenty of time when it comes to paperwork with tutorials and grades. While observing a TP, the trainer gives stars (from 1 to 5), which are then weighed at stages 1, 2, 3 and at the end of the course, and can be used to write stage reports. Some trainers say that this system depersonalizes feedback and makes it more difficult for trainees to follow. However, feedback form can be made more informative by typing How does asking ‘do you understand?’ help you see that they know what to do? In addition to giving 2 stars for 5f. I can also copy-paste those questions into the document I am going to print out and distribute right after the TP so they know what we will be talking about. Unfortunately, it’s impossible to paste a picture into the document — simple word processing software is more helpful if you want to embed pictures into the document. However, no word processing programme can give you a summary of grades for every criterion, their average, or show comments from a preceding TP. It’s been a long process, and we are still working on it. On our August course we implemented an advanced course management system. For the October course we set up moodle as a collaborative platform for our trainees. Even though not always a success, technology has gained ground in the world of ELT training, and if we refuse to adopt technology, we may end up left out of the world of ELT training. – On every course I’ve taught there was at least one person who submitted lesson plans written in pen. 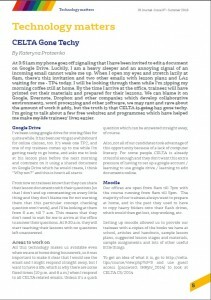 Reasons were varied, including laziness, shallow attitude towards learning, no computer, poor computer skills, etc. – On every course I’ve taught there was someone asking me, “how do I print out this document?”, which tells me that this person isn’t exactly friends with technology. Making technology mandatory would probably be a crime and would result in a lower rate of acceptance onto the course, dissatisfaction, frustration, poor motivation and lower grades. I might reconsider this conclusion in a few years, but for now I wouldn’t dare to force trainees to use google drive or moodle. Moodle For CELTA: Yes, It Does Work!